Roles and permissions give your company the ability to control and assign what users can and cannot do in ProProfs. You can assign every user in ProProfs is a role when you add them. Learn more about adding users. Administrator - Administrators have access, and can make changes, to all features and settings. Editor - Editors can publish and manage pages but cannot change the settings. Contributor - Contributors can write or edit pages but cannot delete or publish them, neither can they access the settings. Viewer - Viewers can only view the content, similar to logged-out users. This role is designed for private sites. Each role can perform a certain set of tasks, called Permissions. When adding/editing users, you can limit which sites they can access. This option allows you to restrict a user's access to certain sites. By default, a user is allowed to access all sites. 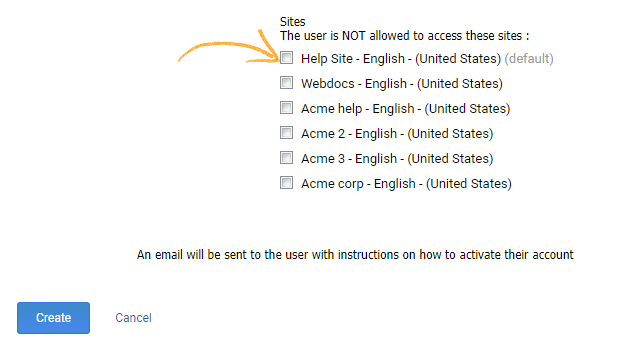 To restrict a user from accessing a certain site, click the box next to the desired site (the box will show a check mark next to the restricted site).